UPDATED: Fri., Aug. 3, 2018, 8:27 p.m. Officer Brad Lewis wasn’t expecting to save a little boy’s life when he responded to a call last month. Keenan Woods, who is 5, had suffered a seizure, and was choking on his vomit. Lewis had heard the fire department already was on scene and doing CPR, but he was nearby and came anyway to see if he could help. Lewis, who spent about 9 months going through medical training in the Army, was better equipped to handle medical emergencies than other officers who receive more basic training, Meidl said. Lewis, who was coming from another call, happened to be nearby when he heard the general broadcast for the medical call. He put himself on the assignment, thinking he might be able to help as backup. But when Lewis arrived, he realized the fire department hadn’t arrived yet. “I show up on scene, and I didn’t see a fire truck. Not good,” he said. Outside, the boy’s older sister was waving for help. Lewis ran in, where he took over for the boy’s father performing CPR. Lewis started doing CPR, pausing briefly to reassess when someone said Keenan seemed to be gaining consciousness, before continuing when the boy failed to respond. After roughly 20 more seconds, he had success. “My partner was like, ‘His eyes are moving,’ ” Lewis said. At that point, he stepped back and allowed the fire department, which had just arrived, to take over. Officers are under no obligation to respond to medical calls, Meidl said, but Lewis stepped into the role immediately when he saw an opportunity to help. “It’s a testament to Officer Lewis’ character that he didn’t hesitate to respond,” Meidl said. For all his heroics, Lewis downplayed his response. He didn’t know at the time if the boy was out of the woods, or if he had sustained a brain injury. Still, the boy’s mother, Malia Woods, told the Spokane Police Department the family is deeply grateful. The boy is doing well, and is now taking seizure medication. 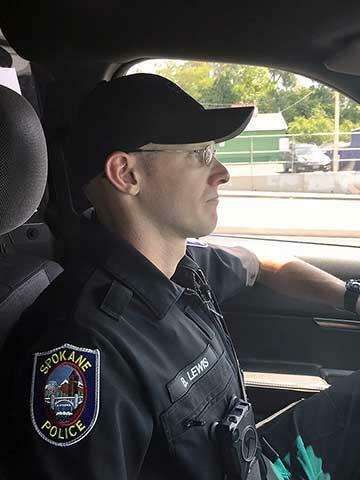 Lewis, meanwhile, just completed his first year and a half with the Spokane Police Department, and finished his probationary period last week. He is now a full officer. Published: Aug. 3, 2018, 6:23 p.m. Updated: Aug. 3, 2018, 8:27 p.m.